Carefully crafted to compliment our live edge tables, the live edge credenza features the same high quality materials as our tables. Soft close adjustable hinges allow for easy use with the solid wood and blackened steel. 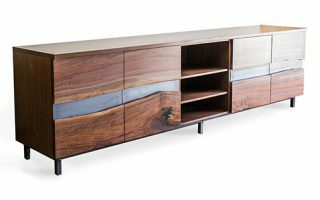 Our credenzas can be customized to any size, species, or finish. 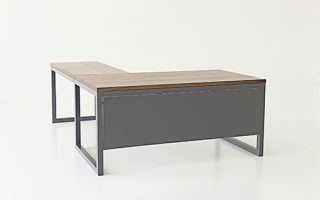 Available with or without the return the media desk fits the modern office. 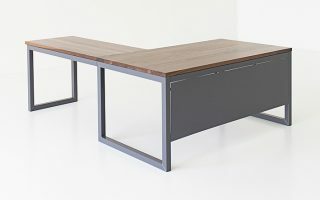 The solid wood work surface resting on steel legs is both durable and attractive for the modern office. 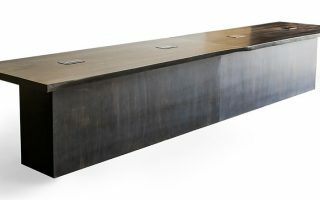 The media desk is available in custom sizes, layouts, finishes, and species of wood. 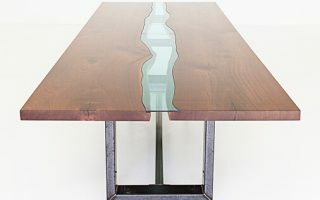 The river follows the curvature of the live edge slabs growing wider or slimmer as it flows. This perfect example of Pennsylvania walnut, blue river glass, and blackened steel is both functional as it is beautiful, and natural as it is man-made. Available in custom sizes, species, and finishes.